Is there a trick to remove the steering wheel on a slough traction? I've removed the cover, the nut and washer, but I assume I need some kind of puller. Doesn't look like this wheel would work with a standard one you could get from supercheap or anything like that? Secondly, I would like to reconnect my interior light. I seem to be missing the base? Is this a standard lucas item I can get a new one from? Or does anyone have one they would be willing to sell? 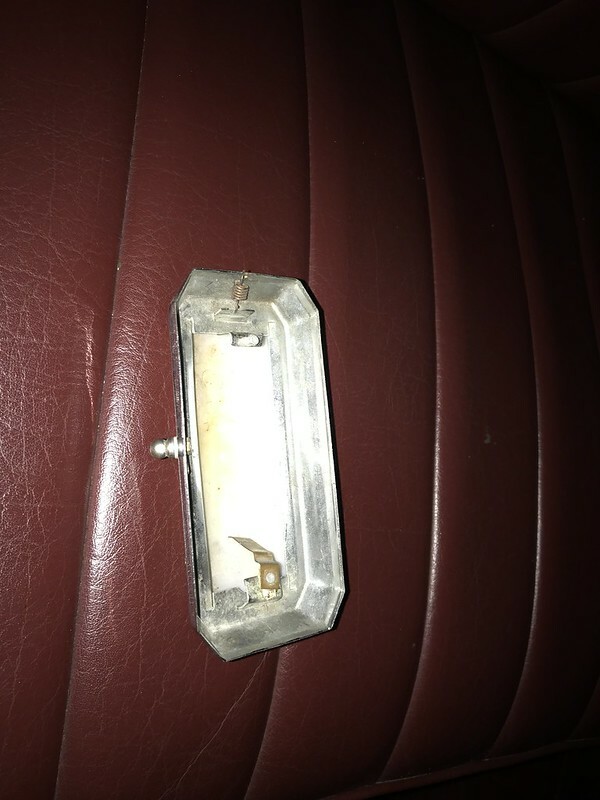 Is this even the right one for a 1954 Light 15? I usually plant my feet on the floor, get my muscles out and wrestle them off. One tip though if you use this method. Put the nut back on the shaft. If you don't you'll hit yourself on the nose with the wheel. jaahn, forumnoreason and brycedunn like this. a knock with a soft mallet it should come apart. Srew the nut on the shaft with two turns to go, so you don't injure yourself our your helper. forumnoreason and brycedunn like this. That wheel is only on a taper and a woodruff key. There is no spline. Use a block of wood behind the centre boss and hit the block with a Mallet. The interior light is complete. The end plate is spring loaded and can be moved outwards to release the lens. The base then is screwed to the wooden roof rail through the head lining. BTW that is the wrong steering wheel for a car with round dials. The correct one is brown and attaches with a multi holed plate that allows almost infinite position adjustment so that the spokes can be positioned horizontally. That wheel is only on a taper and a woodruff key. There is no spline. Use a block of wood behind the centre boss and hit the block with a Mallet. Thanks for the replies on the wheel. Its never been on straight since I got the car and it would be nice to have it straight. I'll give this a try in the next day or so. I wondered that as I had seen some different ones on cars for sale. From what I gather there were not many round dial cars made so the chances of finding a decent one are probably low. The interior light is complete. The end plate is spring loaded and can be moved outwards to release the lens. The base then is screwed to the wooden roof rail through the head lining. I can't see how it attaches to the car. 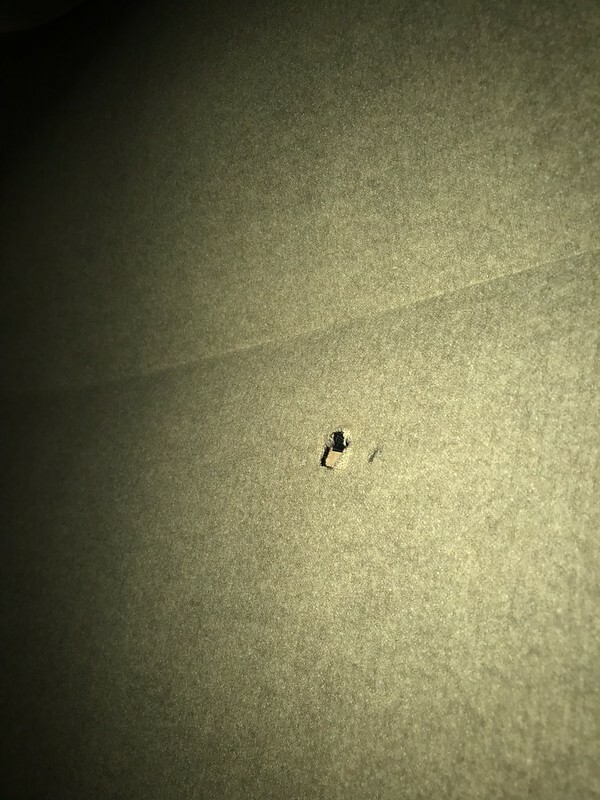 On the headlining, there is a hole where I can feel the wires (taped up with elec tape), but nothing to attach the light to. The wheel will not go back on straight with out some serious work on the steering rack. The trick is to have the entire rack out of the car and dismantle it completely except for the steering column and its bearings. 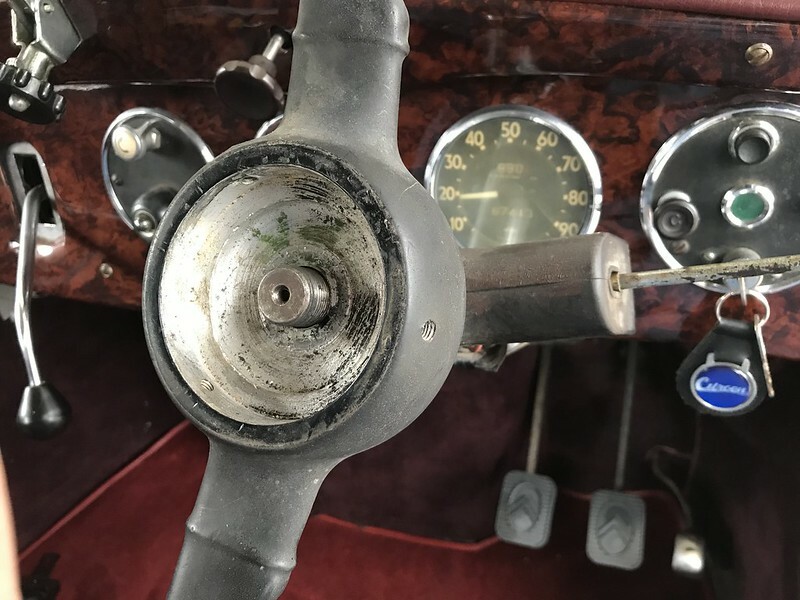 The steering wheel needs to be loosely fitted to the column with the woodruff key in place. Then the rack gear is fitted with the wheel spokes quite off horizontal . This is a trail and error process. When you fit the rack and can obtain a measurement of 37mm +/-2 protrusion of the rack teeth past the end face of the steering column bearing housing ( end cap removed ), and the steering wheel spoke at the horizontal you then will have a horizontally orientated steering wheel. Paragraph 16 Operation 125 Page 81 of the Work Shop Manual. Of course then you will need to reassemble the rest of the rack. 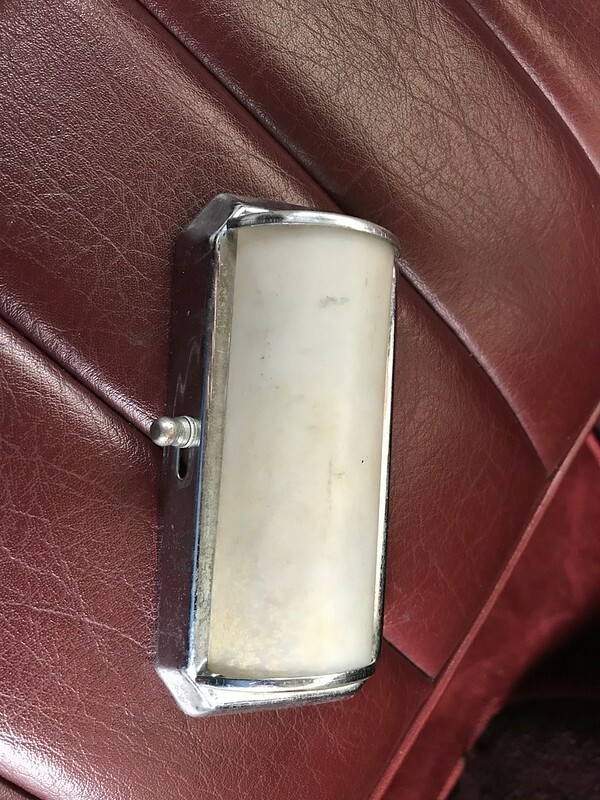 It looks like the back plate of the interior light is missing! ( As you originally suspected). Thanks... Since the steering column looked splined I was hoping I could make it straight just by taking off the wheel and re-orienting it. Sounds like this is not the case. I did this on a Mercedes I had it was a 10 minute job. You do realise that if you fit the correct later model steering wheel then the process I outlined is not necessary. In this case the wheel adjustment is carried out with the steering boss! There is another alternative but it means modifiying the steering wheel. First it is essential that the alignment is correct and that the track rods are equal in length ( very important for correct Ackerman principles to be maintained on left and right lock. Mark the end of the steering column the exact position of the key slot. Chalk or marker pen etc. The wheel needs to be loosely fitted without the woodruff key. Then transfer the mark made earlier to the wheel boss. Now by carefully filing cut a new key ay slot in the wheel boss. Finally refit the key and wheel in the new position. I think I will keep an eye out for one of these first, and if after as while I don't find one, look to the other solutions proposed.